You should start by thanking your audience for coming and organization for inviting you and also the person who introduced you. According to human nature, it makes them feel proud and happy about your presence and plays a vital role in connecting you to the audience. You can also put a better impression by saying any positive statement or quote. Such as,” we are really going to have fun in next 20 minutes because I am going to tell you something about today’s topic that you probably have not heard about.” Or a quote regarding that day’s topic which will make audience be more attentive and leave inspired. You can start by quoting a well-known person to fill them inspiration. For instance, as wise Maya Angelou said,” People will forget what you said, people will forget what you did, but they will never forget how you made them feel.” Or you can also refer to something or event that has recently taken place. You can begin by making a shocking statement. For instance, according to a recent study, there will be more changes, more opportunities and more facilities in the upcoming years. and 78% of the people will be doing something different within two years. Bill Gove used to walk to the stage and say,” come here I want to say a secret to you”, and then he would wave them forward as though he about told a secret to all. Then everybody in the room would lean forward to hear the secret that he was about to share. People would all then realize what they were doing and break out into laughter. It was a wonderful way to make the audience be more attentive. You can also start your speech by saying hello and then asking a question connected to the topic. This way you will make them participate in your talk. As, we all don’t really like to listen but to listen, so it is a good way to start. One of the best ways to start your speech is to say a story that grabs the audience attention. From early childhood, people love stories of all kinds. When you start with words such as, “once upon a time…” you will tell audience story is coming. They will rapidly settle down, become quiet and lean forward like a child. When you speak effectively, you automatically give them hope. You then need to remember that whatever you speak should be related to your topic and to actions you want people to take. 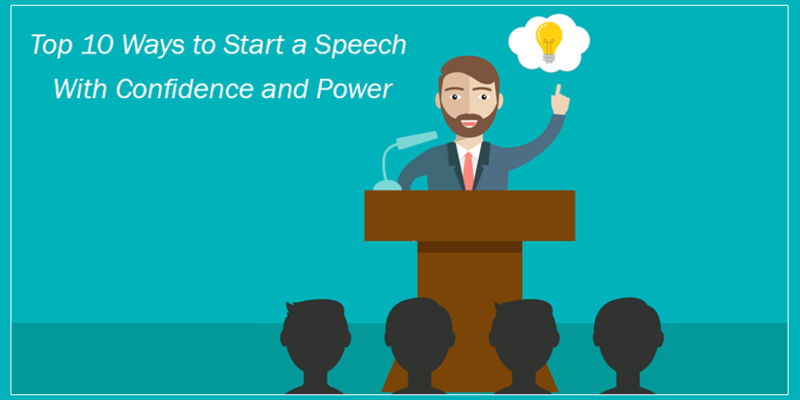 I hope these top 10 ways to start a speech with confidence and power will help you to start your speech in a better way and please feel free to write your feedback in the comment box below.